Discover the history....Order Your Copy Today from Amazon! Click to learn more Please help by Donating to the Duffy's Cut Project! Discover the history....Order Your Copy Today from the Publisher! Museum, music, history, events and more to honor the 57 men and women of Duffy's Cut. The latest in the story of Duffy's Cut written by William E. Watson and J. Francis Watson and published by The History Press. Read about the harrowing modern-day excavation of the mass grave where these murdered and sick Irishmen were so unceremoniously dumped. The authors reveal the tragedy, mystery and discovery of what really happened at Duffy's Cut. Blackthorn, Wally Page, The Kilmaine Saints, Cooper & Kenneally, Marlan Makins & Gabriele Donahue with (Paddy O'Neill, Jeremy Bingaman and Deb Shebish), Jon Bulman, Frank Watson, William E. Watson, Sr., Mickey Coleman with Joe Devoy and Dropkick Murphys. 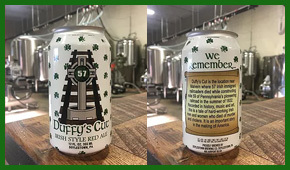 All proceeds benefit the Duffy's Cut Project and the continued efforts to bring the remaining Irishmen home, to rest in peace. What have our team members been saying? "Their American dream lasted no more than six weeks". "We believe that a large number of them had contracted cholera by the end." "We see God's hand and a greater purpose in all of this, mysteries that have remained mysteries for generations are supposed to remain mysterious." Speaking at the wake of Catherine Burns in Washingbay, near Coalisland in County Tyrone. "Her story of hopes dashed and dreams shattered is not unique. So in honoring the homecoming of Catherine we are honoring countless other exiles who sailed out of Ireland in the hope of a new life far from home but did not find the streets paved with gold." "I ended up being a pallbearer at the burial," (referring to the reinternment ceremony at West Laurel Hill Cemetery) "For anyone with a passion for history, seeing these men finally given honorable burials, it's any historian's dream to be involved in something like that." "Every skull we've recovered has unnatural trauma, the most recent one looks like it has a hatchet wound." "The extent of the trauma suggests some significant level of violence"
"You have brought Catherine back from her exile to her native pastures. Now there is no fear, no terror for Catherine anymore." "I was really struck by the human tragedy of all these young people dying so soon after coming here, and family back in Ireland never knowing what happened to them, or even knowing that they were dead, their story needs to be told."